Spring is here, which means it’s time for us to lighten up and clean out. You already know about spring-cleaning your home, but what about spring-cleaning your body? Has your skin been acting up? Do you wish you had more energy to make it through the day, instead of crashing mid-afternoon? Do you find yourself craving sugar, carbs, and other junk food? Is your digestion sluggish and you have heartburn or other gut issues? If you answered yes to any of the above questions, it’s time to try a gentle but effective detox! 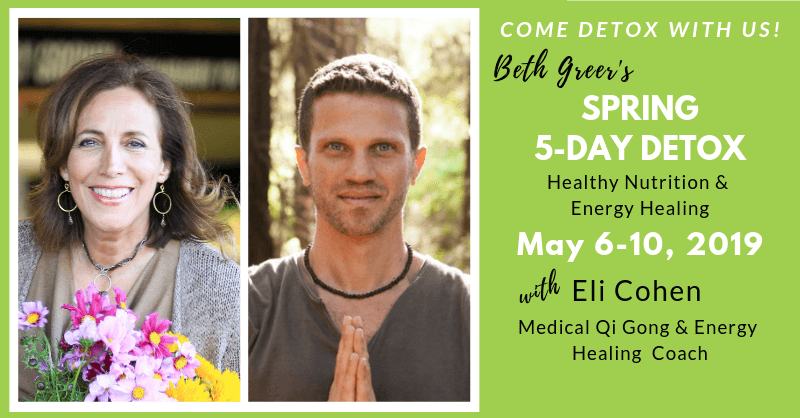 Join me and Medical Qi Gong Master Eli Cohen, May 6-10, 2019 and learn to re-set your digestive health by discovering how to clear stagnant energy from the gut while improving eating habits, eating healthy whole foods and learning how to feed your body what it really wants and needs. I’m delighted Eli will be joining us for this Spring Detox. He practices Qi Gong, an ancient mind-body healing art. What I’ve seen in my own life and in those of my clients, when you combine the energy medicine of Qi Gong with the elimination of poor food choices, magic can happen! You’ll learn about lifesaving foods and easy, yet powerful mind-body practices to release stress from the digestive tract and restore a state of internal flow, so you can feel vital and assimilate food with ease. I had the great pleasure to take part in the winter cleanse with a well informed and gracious mentor Beth Greer. This cleanse is not taxing nor does it follow the more challenging cleanses that completely dominate your life without enough real, healing foods. I’m not into starvation and so I finally found a cleanse that nurtured me, inviting conscious eating and rebooted my energy! I’ve changed my diet and am way more conscious and knowledgeable about what my body needs!! Five stars out of five! Why do a detox, anyway? Don’t our bodies know how to get clean all on their own? The truth of the matter is that we live in a toxic world, and we’re exposed to pollutants on a daily basis, whether it’s pesticides in our food, fumes from traffic, or even toxic materials used to make computers and phones. Our eating habits often reflect our emotional state and not always nourishing. Our modern life stresses, negative emotions and challenges add on to the state of our internal inflammation. Our bodies can only handle so much toxic input at a time, and when we get overloaded, we often experience negative symptoms like headaches, irritability, belly fat, bloating, breakouts, fatigue and more. Rev up your metabolism. A properly done detox can be great for re-setting your metabolism and burning fat that’s been clinging to your body for years. De-stress your gut! This will happen when you learn easy and proven ancient practices practiced by millions over the world that energize and release stress from digestive system. Give your body a break! Digestion takes a lot of energy, and it’s important to give our digestive systems a break every now and then so they can repair damage done from foods that can damage them, like fried, processed, and sugary treats. Reset your habits. Have you noticed that you’re reaching for the candy bowl more often than before? Are you drinking more wine than water these days? Cleanses are great for helping you become aware of your bad habits so you can start changing them. Make you feel better than you’ve ever felt before. Many of our clients tell us they have more energy, sleep better, and have more drive for life than ever before – pretty incredible for just 5 days. What I loved about Beth’s 5 Day Detox was that it wasn’t like other cleanses I’ve done that were crazy strict, depriving me of all carbs and sugar, including fruit. I’d lose weight, then go off the cleanse and “go crazy.” On Beth’s cleanse I lost 10 lbs, and feel great! The recipes are delicious and I love the daily emails reminding me why I’m doing this. Beth is very knowledgeable and helpful in getting us through this journey. The zoom calls were wonderful and supportive. I highly recommend the 5 day detox. It was easy!!!!! Re-set your eating habits so you can get back on track with your health goals. Curb your sugar and carb cravings, and stop eating the junk that keeps sneaking back into your diet. Receive access to an extensive video library containing special practices to heal your gut to practice daily. Enjoy a whole-foods based cleanse with lots of support and yummy recipes – there’s no fasting or feeling deprived here! Learn how to really feed your body so you have radiant health and energy, rather than relying on caffeine and energy drinks to get you through the day. Dates: This group detox will be 5 days long, from May 6-10th. It is whole foods based, meaning you’ll be eating lots of fruits and veggies, whole grains, and lean proteins. You won’t starve!. Medical Qigong Master Eli Cohen will teach you powerful techniques to clear stress from your digestive system, so you can assimilate food with ease. A LIVE pre-detox training video call on May 4thwhere Eli and I will walk you through what to do and what to expect, plus you’ll be able to ask us questions. Tons of support from me and Eli, and from the detox community via our members-only Facebook forum. If you’re a YES, sign up right now. Regular pricing for these detoxes are $197, but when you sign up by midnight (Pacific) on April 26th, you’ll get our EARLY BIRD PRICING of just $157. We’ll kick off on May 4th (where you’ll have a live video training call with me and Eli) and detox May 6-10th. If you’ve never detoxed before, don’t worry: We’ve got you covered. This detox program is specifically designed to make things simple for detox beginners and people with over-packed weekly schedules. A LIVE pre-detox training call where I’ll outline exactly how to prep so you won’t find yourself stuck in the kitchen all week, plus I’ll go over all the detox details. . Eli will uncover the keys to gut detox from an energetic, self-healing perspective. Dozens of recipes for breakfast, lunch, dinner, sweet treats and snacks – and ideas on how to tweak them so they meet your own flavor needs. 5 days of easy Qi Gong sequences to support your gut health. There’ll be a short (less than a 20 minutes) morning routine to set your digestive system for a happy start to your day, as well as a short evening sequence. A daily protocol that spells out exactly what to do and when to do it, so you won’t be wondering what’s next. A group forum where you can connect with me and Eli and other detoxers to get all the support you’ll need to stick with the program to the end. Eli and I are so committed to your success that you’ll get the following bonuses just for signing up! You can start the process of healing your gut for the very low investment of only $157. Money back guarantee: We believe our Spring 5-Day Detox will help you feel and look better. If you follow the protocols and you find that doesn’t happen for you, just send an email to me within two weeks of signing up and I’ll refund your money within 72 business hours, no questions asked. There’s absolutely no risk – if it doesn’t work, I’ll give you your money back. Have questions? Great. I’d love to help you figure out if this is the right program for you. Send me an email and I’ll get back to you ASAP.